Incorporation of "repeat me beep" and "daily" to repeat me app. 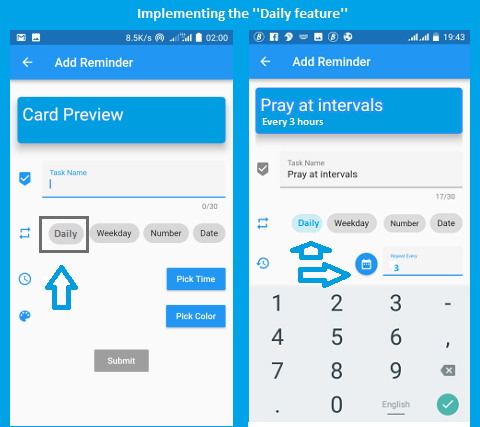 Report me is an open source application that can be used to plan a reminder at intervals. It is used to schedule notifications and keep track of the things you need to do. It is beneficial, and it has been a good source of a reminder for me so far. The Report me app has no other function than serving as a reminder for users on different occasions. The app is easy to use. 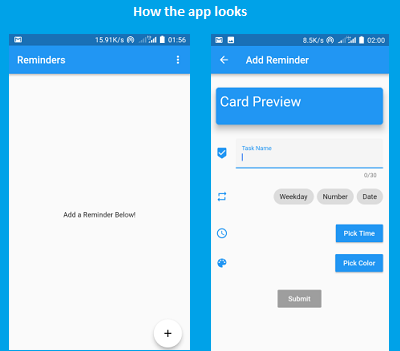 As a first time user, all you need to do after installation is to launch the app and press the plus button by the right side below the app to add the task you want the app to continually remind you of. You can set your reminder based on weekday, Number, or Date. Also, you can set the exact time you want the reminder to beep, and pick any desired color to make the app's UI look enticing. I love almost everything about repeat me app except some few things I see as limitations. While setting my task for a reminder, I noticed I couldn't use the app to set hourly/ minutes reminder. However, each time I set a reminder, I miss the immediate notification period due to the one-time beep. At first, I thought it was as a result of not setting my phone volume to the highest peak, but I was wrong. Even after increasing the volume, I still miss it. (Not always but I can record a 50: 50 tie). All these led me to come up with some ideas that would have an effect on the Card preview(Add reminder) page and at the same time improve the users experience. In the image above, you would see my tasks arranged accordingly. Let me list them below. These are how I can set my reminder. There is no way I can set a task for the app to remind me on hourly or minutes basis. Because of this, I propose the feature below. Daily: With this feature, I will be able to set my tasks for a consistent reminder at short intervals. For example, if I want to pray every 3 hours today, I will be able to set my reminder to (repeat me every 3 hours). The add reminder page will be a suitable place to add the "daily" feature, probably beside the weekday feature. A click on "daily" would display "repeat every" along with the already implemented "pick colour." You can then click the " repeat every" and type the number of hours you want as your reminder interval. Finish it by picking a colour and submit. I think this aligns with the app settings. I came across an opened issue on github,and at first, I thought it was about what I wanted to suggest. Though they both stress on Notifications, they are different. That idea wouldn't solve what I encountered using the app. The repeat me beep will not stop after the first beep to notify me of my commitment. It will continue until I'm aware and stop it. To solve the issue of missing reminder notifications, I would love to see a "Repeat me beep" feature on repeat me application. This feature can be implemented on the add reminder page as well by the top right side as shown in the mock ups. The concern of users should be put into consideration before implementing this feature. Why? Because some people don't like continuous disturbance. To perfect that, the "repeat me beep" would have an off and on button. So users will be able to decide whether to turn on the feature or not. It would be a thing of choice. I'm sure users like me would always leave it on from January to December. The images below displays how the Hourly settings which is the daily will look after implementing it. Once the daily feature is clicked, some other features will pop up below where the time and colour can be set. 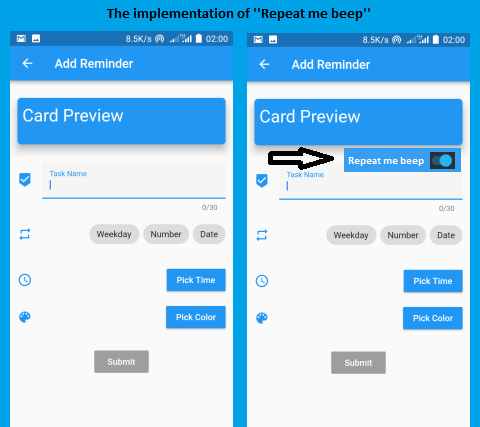 The below image displays the Repeat me beep feature. The off and on button can be toggled on and off as the user pleases. If it's left off, there will be only a beep to notify user, which is the default settings. But if the user leaves the button on, the repeat me beep will be active to nag until action is taken by the user. The "daily feature implementation would be an important addition to the existing ones. Users would not only enjoy managing their tasks but also get fulfilled at every timely appointment. 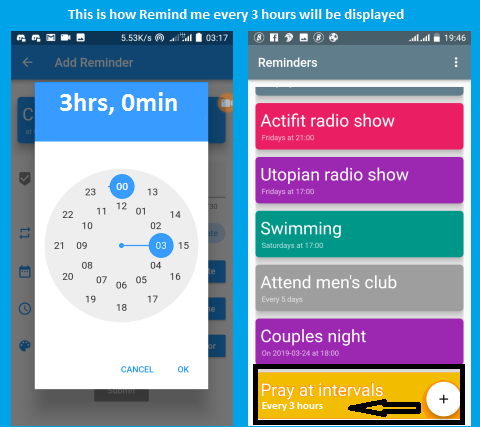 Setting an hourly/minute reminder will be possible, and users will be glad using repeat me app. However, the "repeat me beep" will serve as a nagging sound in case you are unable to hear the first reminder beep sound. 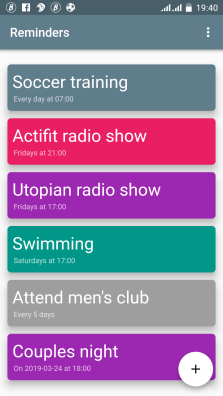 The implementation of these features will make the repeat me app complete and more unique. I would love to see the features implemented in the next development update. Nice to see you contributing after a very long time. Though the suggested features are common might be a little trivial as well but they will have some positive impact on the application. The suggestion has been written very nicely and the format you have used is excellent. We hope that you will keep contributing with unique ideas and features in future. Thank you @syedumair. Hopefully I will contribute often now. Thank you for your moderation. Actually I expected more than what I got, but all the same, you treated it nicely. Thank you.